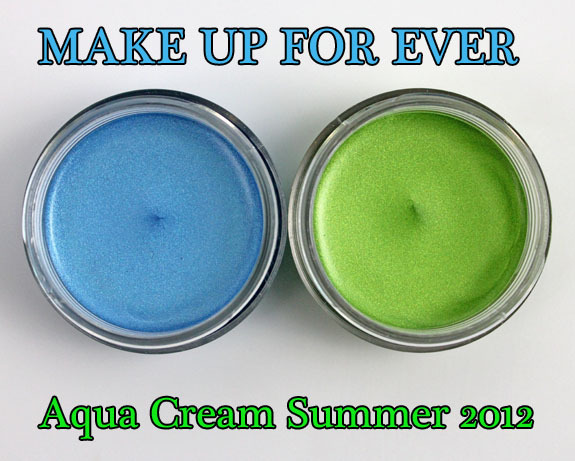 Make Up For Ever Aqua Creams are nothing new, but they do have four bright new summer shades out! These cream shadows are waterproof, smudge-proof and crease resistant. They come in 25 shades with the newest being: #23 (bright lime green), #24 (bright yellow), #25 (bright aqua blue) and #26 (grape purple). #25 is a bright aqua blue shimmer. #23 is a bright lime green shimmer. Both of these shades are nicely pigmented and feel smooth and creamy. They blend out really nicely also, and you have a bit of time to work with them before they “set”. They’re also build-able! I always apply with my finger because I just find that easier, but you can also use a brush. 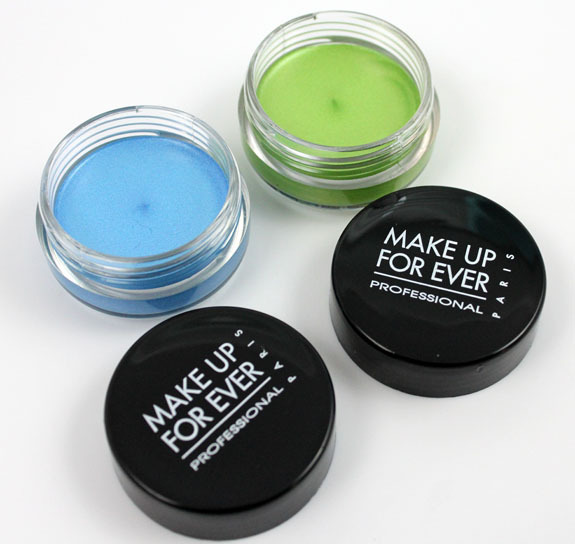 As far as creasing, I always wear them over an eye-primer and they last all day no problem. The one caveat for me is I have to apply them then let them set while my eyes are closed, otherwise I will get slight creasing in the eye socket (see photos above this happened a little bit). While they are waterproof, they’re easy to remove even with a mild cleanser and warm water (I normally use Cetaphil). 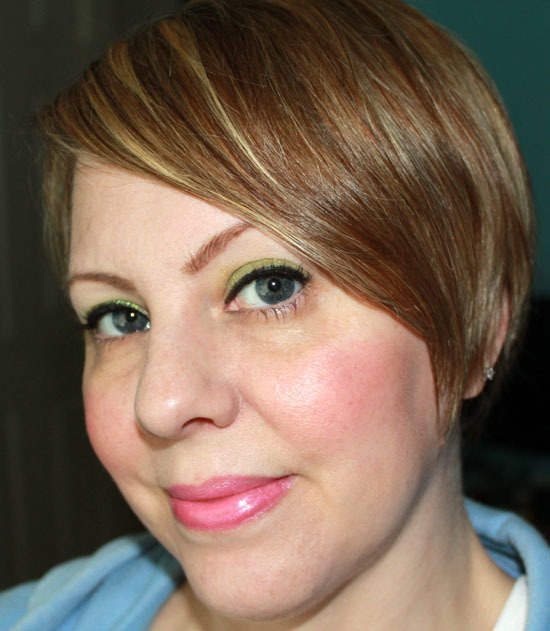 Overall: I love a light wash or major pop of a bright color on my lids in the summer. These two shades are ones I will definitely be incorporating into my looks on hot summer days! Availability: Make Up For Ever, Sephora. Pricing: $23.00 for 0.21 oz. Are you loving these new bright shades? Note: Make Up For Ever is cruelty free. Sunny @ Mostly Sunny´s last post…Bring Mediterranean to Your Nails with Dior Vernis Saint-Tropez! Thanks! I like that you can do a really subtle wash or layer for a brighter look! The lime green looks lovely on you! I like the blue, not so much the green. The green can be tricky! I love the aqua creams. They’re so much fun. I don’t dislike the blue, but I like the green! Yeah the green is definitely my fav. Oh the lime green!! They both look really nice on you, not over-the-top at all. These colors look lovely on you! 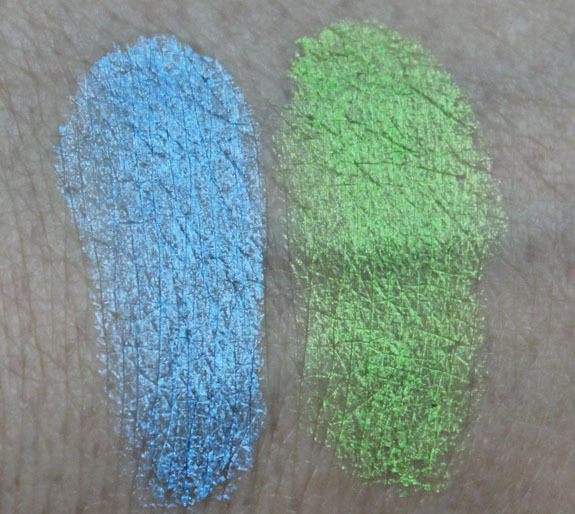 They look really bright on your swatch and in the jar, but on you, they look more subtle. Very pretty! They are really pretty, but that green is my favorite of the bunch. These are really summery. Of course I love the green. 😉 It would be neat to incorporate both colours into a single eye look. I love the bright lime green! It looks fantastic on you. I might have to try this! Such pretty colors! They both really complement your eyes. Kelly, I was dubious when I saw the colours. I normally stay away from anything that bright on the eyelids. But I have to say, you really pull it off. Both colours look fresh and summery on you, although I have to admit that the green is my favourite on you — you look fantastic in it. You’ve made me re-think my stance on bright colours. You and I have similar colouring so I always pay attention to what works on you. Thanks! I looooooove the Aqua creams. Even if I open my eyes too early and there’s a bit of creasing, I just smudge it with my fingertip and it’s gone. My favourite one to wear as eyecolour is #7 (hot pink). It’s so different from what most people wear on their eyes. 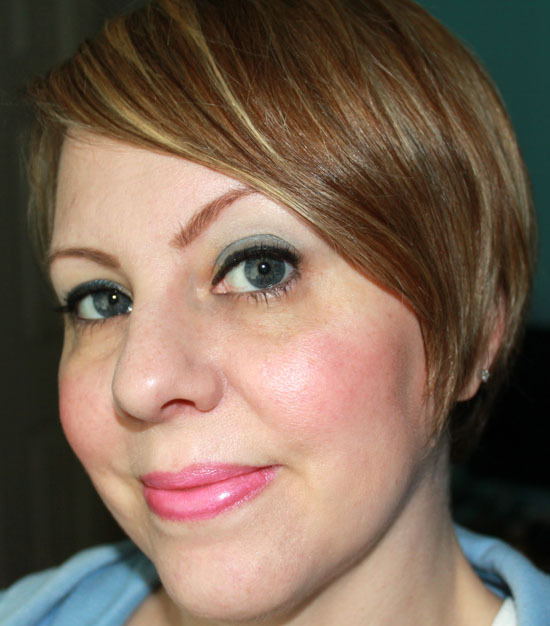 If your outfit is muted, like all blacks/greys, neutrals, having hot pink eyeshadow/liner and glossy lips really gives your look a lovely punch! The blue looks great, but I’m not sure if I could pull that off! These look great! They scared me in the jar but look so nice on you. What color are you wearing on your lips? Such a pretty pink! I love the lime green on you, it looks so good! You do great wearable neon looks and I always love to see them. Will these be permanent or only during the summer? I *think* they are permanent.